Villa Mistral is nothing short of Stunning. Every detail is perfect, even the amazing waterfront location with surf sounds and ocean breeze. 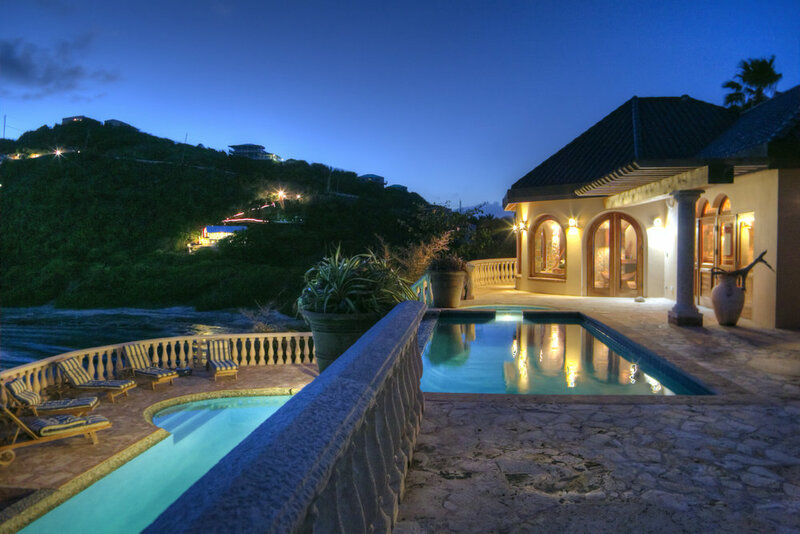 Villa Mistral has 6,200 sq ft of gorgeous living space with breathtaking views of the crystal blue ocean, including 2,400 sq ft of impeccably designed interior space with a blend of Caribbean and South African custom furnishings, artwork and decor. The outdoor space with 2 infinity edge pools, coral stone patio and 180 degree views is the type of place you may never want to leave. 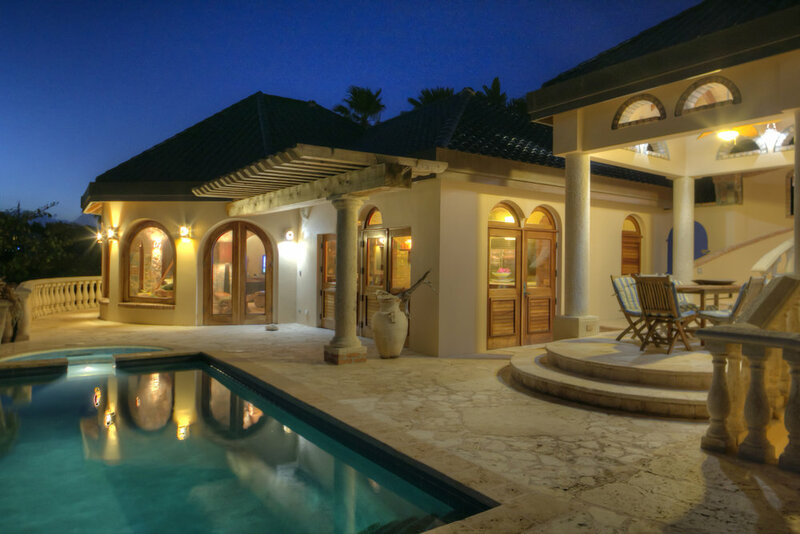 This five bedroom Caribbean style villa includes two infinity pools, a grotto and waterfall, coral stone flooring and railings, state of the art Sub Zero and Gaggenau stainless appliances, outdoor dining under a large gazebo, dual sinks in baths and outdoor showers, custom hardwood doors and windows, custom ceramic roof tile, and a powerful backup generator. The privacy of Villa Mistral is unmatched on St John as it lies at the end of the road on a secluded bay, surrounded by lush gardens and perched directly on the beach in dynamic Hart bay. 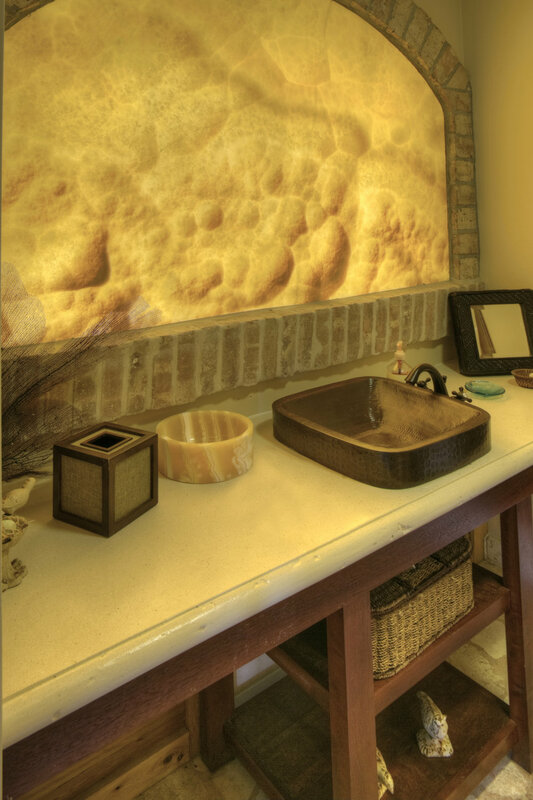 All the essentials and conveniences are supplied throughout the gourmet kitchen and luxurious baths, leaving you to enjoy our ample amenities and providing a carefree and comfortable island experience. 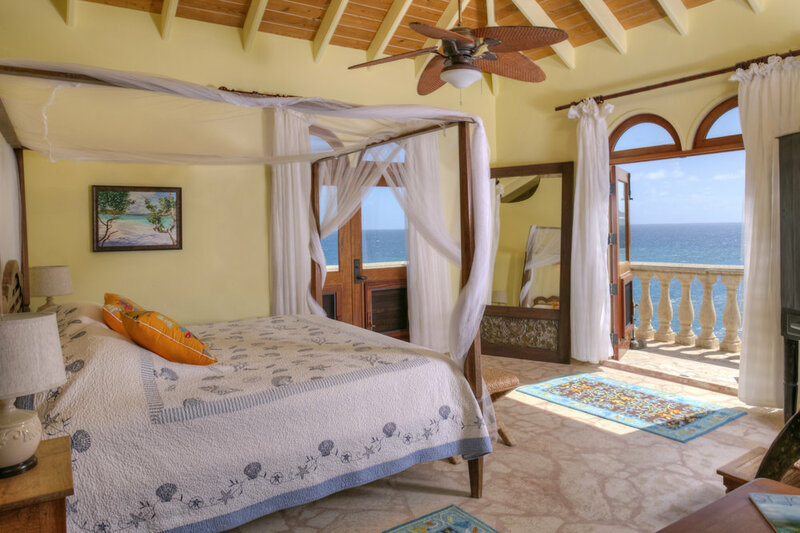 Listen to the waves crash against the rocks and lap on the shores from your bedroom veranda and step onto a secluded stretch of pristine beach right from the gardens of Villa Mistral’s beachfront villa... this five bedroom retreat is a mini paradise unto itself! Relax and fall asleep to the soothing sounds of surfing waves and breathe in the clean moist sea air. 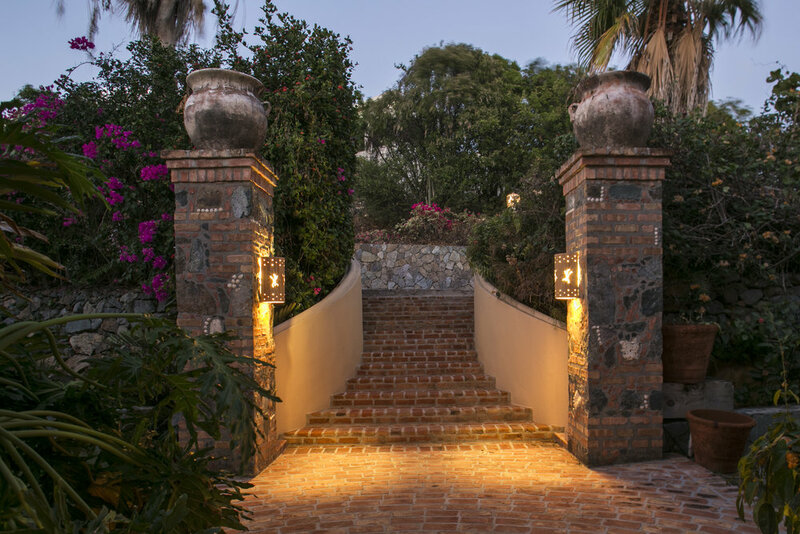 Villa Mistral sits on an acre of lush gardens and fruit trees in dynamic Hart Bay. Less than 40 feet from the oceans edge, lay in one of two infinity edge pools and spot turtles ducking the waves up close. This romantic and exciting villaalso has a waterfall and intimate grotto, custom and unique furniture including a swinging boat hammock, a private gym and recreation room with billiards and ping-pong table, and large backup generator. Villa Mistral offers a magnificent balance of ultimate privacy in each guest room with an inviting interior and exterior living space for intimate family gatherings. Every room of Villa Mistral is built and decorated with tremendous care. It is one of those homes that will no doubt leave an impression even on the most discerning of guests. Simply, it is amazing. Supplies Face Soap, Shampoo and Conditioner, Hand Soap, Napkins, Towels, Kitchen Condiments, Liquor Bar, Kitchen Detergent, and Cooking Utensils. Laundry A washer and dryer are available for your use. Dry cleaning is also available through the concierge. Telephone Calls A house landline is available for calls to the United States. International calls will be extra but may not be available depending on the country. Holidays (Xmas, NYE, Presidents Week, Easter) - $3200 per day full house, $2400 per day for 1-4 people (excluding Xmas/NYE for low rate). CONTACT US TO CHECK AVAILABILITY AND GET A QUOTE OR ASK ABOUT SPECIAL DEALS!